DermaSet Skin Care Reviews - Does It Really Work? 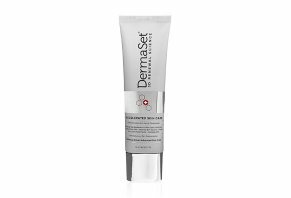 DermaSet is a celebrity-backed anti-aging cream that’s claimed to use natural ingredients to provide firmer, brighter, plumper, and more moisturized skin. Advertised as equally effective for men and women of all skin types, DermaSet Skincare is an all-in-one anti-aging formula that promises to deliver a blend of 10 clinically researched botanicals and natural elements that can increase skin elasticity, firmness, and moisture retention. The website tells us that the luxurious, nutrient-rich cream should be applied once in the morning and again in the evening, in place of your daily skin care moisturizer or other facial product. After 30 days, we’re told you’ll notice a reduction in age spots, crow’s feet, and wrinkle depth. In addition, the company claims DermaSet will provide more even tone and texture, your skin will be soft and ultra-hydrated, you’ll boast an “overall younger looking air brushed appearance,” and the serum’s antioxidants will help counter the aging effects of stress. And with time, this stem cell renewal treatment will only penetrate your skin more deeply, thereby boosting its impact on both the face and the neck. Just because DermaSet’s cream is clinically tested, dermatologist tested, and hypoallergenic, does this mean it will necessarily make a valuable addition to your skincare regimen? Even then, will it help you reclaim your youth, as claimed on the website? Does it actually represent a time machine in a tube? Is it the most powerful option around? You're here for some answers, so let's dive right into the topic of stem cells. What Role Do Stem Cells Play In the Aging Process? In a nutshell, there are basically two types of stem cells: Adult stem cells have the ability to transform only into the same type of tissue (e.g., muscle, skin, etc. ), while embryonic stem cells are pluripotent; that is, they have the ability to become any type of cell in the body. In either instance, the body uses stem cells to help maintain and repair tissue. Consequently, it might make sense that boosting stem cell count on the skin could help alleviate some of the side effects of aging. But exactly how does DermaSet claim to do this, and what kinds of results might you realistically expect? Like the human versions, plant stem cells are undifferentiated and can become any other cell in the organism. And according to Truth In Aging, there is some clinical evidence that edelweiss, mushroom, and apple stem cells may impact different aspects of external aging. BVC-OSC is a proprietary form of vitamin C. In general, the Micronutrient Information Center at Oregon State University indicates this ingredient has been shown to provide antioxidant benefits for skin and prevent ultraviolet damage. Argireline (formally known as acetyl hexapeptide) is another proprietary ingredient, although it works by inhibiting muscle contraction and reducing the appearance of related wrinkles. Manufactured by Lipotec, Chromabright promises to inhibit tyrosinase, an enzyme that plays a key role in skin color. As a result, it’s said to help lighten areas where it’s applied. Dermaxyl is claimed to stimulate cell communication and repair age-related skin damage, while Matrixyl (palmitoyl-pentapeptide 3) is said to stimulate collagen synthesis and skin repair. Outside of Matrixyl, however, we didn’t encounter any double blind, placebo controlled clinical studies supporting these claims during our research. What About the Remaining Ingredients? Hyaluronic acid is a molecule that can hold many times its weight in water, which can help maintain moisture on the skin. Although phytoceramides (plant-derived ceramides) are lipids, they can also help keep skin hydrated and plump. A company representative sent us a copy of a July 2017 clinical study conducted by Abich, Inc., which involved 52 participants. Over the course of six to seven weeks, each participant had a strip containing DermaSet cream adhered to their back for up to 48 hours at a time. No adverse reactions were noted. While this is certainly positive, it’s important to point out that the study was only designed to test DermaSet’s irritation and skin sensitization, not its effectiveness at reducing any of the signs of aging or supporting any of the other claims made by the manufacturer. Are There Potential Side Effects With DermaSet’s Ingredients? The product’s website indicates that DermaSet is specially formulated and doesn’t contain harsh chemicals or artificial ingredients that might irritate skin. And according to many of the same sites listed in the ingredients section above, most won’t cause anything worse than mild, temporary redness or irritation at the application site (no specific circumstances were noted), especially for those with sensitive skin. There have been rumors circulating online that continued Argireline use could lead to skin sagging, although Truth in Aging indicates there’s insufficient clinical evidence to support this. However, because everyone’s skin is unique, you’ll definitely want to speak with your dermatologist about DermaSet before applying it to your face or neck. How Much Does DermaSet Skincare Cost? The only way to purchase DermaSet at the time of our research was through the company’s 30-day trial. Here, you’ll pay $4.95 initial S&H and will be sent a full 30-day supply of the cream. After this time has passed, you’ll be charged the full price of $179. And from there, you’ll continue receiving a 60-day supply of DermaSet once every two months and charged $139 each time. All initial orders come with a 60-day refund policy, less S&H, while recurring orders are only covered under a 15-day money back guarantee and must be sent back unopened and in the original packaging. To request a refund or to cancel your recurring shipments, support can be reached at 855-936-8700 or support@dermasetcream.com. What Can We Learn From DermaSet Customer Reviews? As of 8/8/2018, 102 HighYa readers had given DermaSet an average rating of 4.0 stars. Here, most compliments appeared to reference effective results (reduced appearance of wrinkles, improved skin feel, etc. ), professional customer service, and good value for the price. On the other hand, common complaints frequently revolved around no results, unknowingly signing up for the full-price trial and recurring shipping program, and less-than-stellar support experiences. Granted, the bulk of these complaints were nearly two years old, so the company could have addressed many of these concerns since. On Amazon, we encountered another 175 reviews and a similar 3.5-star customer rating for DermaSet, with many of the same compliments and concerns found on HighYa. From a company perspective, DermaSet (parent company Hollywood Skincare, Inc.) had 26 reviews, 64 closed complaints, and no rating with the Better Business Bureau as of 9/6/17. There, most of these complaints revolved around being charged the full price after the initial trial. Given everything we’ve discussed, how can you decide whether or not DermaSet has earned a place in your home? While there are perhaps thousands of different anti-aging creams available in the marketplace, the American Academy of Dermatology recommends that simple sunscreen (SPF 30 or higher) and moisturizer might be the best place to start. If they don’t work after a few weeks, the AAD recommends focusing on a product that targets your concerns, whether wrinkles, dark spots, or anything else. You’ll also want to buy a product formulated for your skin type, such as oily, sensitive, and so forth, and that’s within your budget. When browsing products, look for those advertised as hypoallergenic and non-comedogenic or non-acnegenic, as well as those from companies that feature a consumer hotline for questions. Finally, they emphasize that, “anti-aging skin care products deliver modest results. You cannot get the results of a facelift from a cream.” As a result, keep your expectations realistic. How does all of this line up for the product in question? On the one hand, DermaSet came with mostly positive online customer feedback, a 60-day refund policy (for initial orders only), a customer service phone number and email address, and several ingredients that had clinical support for their efficacy related to moisturization and the inhibition of muscle contraction. On the other hand, it was one of the highest priced anti-aging products the HighYa team has reviewed to date, and the only way to purchase it was through a trial that automatically rolls into a recurring shipping program. Looking for the most value? As consumers ourselves, we think speaking with your doctor about options specifically formulated to address your concerns, your skin type, and your diagnosis is the best way to go. In the meantime, be sure to read nine home remedies for getting rid of dark circles and how to treat wrinkles, creases, lines, and folds. I think those products are not that good. I bought the face cream but it was smelly after few days. On the other hand, they never contacted me, automatically sent me more product, nor charged my account. So that's good at least. This is not a cream, it' s trick and a hoax to steal your money. Unfortunately, I was foolish enough to buy into this. I ordered the 30-day Free Trial and spoke on the phone with a representative to ask about the return policy. They told me that I may cancel and return the product up until 30 days from that day and gave me the date. I tried DermaAet and did not see a change and called them to cancel on the day I was told to call. In my first phone call, I asked the representative to cancel the product and charge that they put on my card on the 30th day. She told me I was late cancelling and that it was after 30 days. I explained why I chose today to call and she transferred me to Nadia. Nadia told me my charge was canceled after a few minutes of waiting. I asked her if there was anything else I needed to do. She said "No." I then received an e-mail telling me I had to send the product back? I called again to clarify. The woman I spoke to, Anna, claimed to be the manager who "does everything around here, including cleaning the toilets." She told me that it did not matter what the previous representative told me, that I misunderstood Nadia that the product will be refunded when I return it, and repeated aggressively and defensively, "what can you do now, it doesn't matter what she said, the product has to be returned." She said whatever she thought I might want to hear (even that she would fire the girl I previously spoke to. I responded that I did not believe that she would do any such thing due to one phone call), but I was only calling to clear up what they wanted me to do and to tell a professional or manager that I was misinformed in such a rude way. Please do not order a trial or this product from the company. They don't view their customers as people, just as more money. This interaction was aggressive, rude, and the most unprofessional I've ever seen in all of my shopping experience. Simple. Send the tube back and call your credit card company disputing the purchase stating you reason for cancelling. advertises on their website that you can try the product for 30 days, no money down, only pay shipping and handling. This is not the case. Somewhere they have some fine print, not on the site where they are trying to get you to sign up, that if you do not let them know within 30 days that you don't want the product, and send it back, they will charge your credit card $179. If you are one day past that 30 days, you're out of luck. They will not take the product back and you are stuck having to pay for something that was advertised to cost you nothing but shipping and handling ($4.99). Be aware. The DermaSet is so bad and they scam you just for wasting money. It does not have any good effect on skin. It's a scam, so don't buy it. Product is no use. Customer Service is a sin. After many months of using the product, hoping to see something, any slight change would have kept me going – nothing. OK, well, gave it a fair shot, BUT, and this is the kicker, when I tried to cancel future delivers, was totally ignored until I threatened to stop payment and report to BBB. Then they send a very condescending e-mail stating they never received my cancel request. They sent me an e-mail with return/refusal directions and a number that if not used within 3 weeks would be come invalid and refund would be rejected. Of course, as they planned, I'm sure the delivery came 3 weeks and one day. To the day, one day after the precious number 'expired'. So now I have the product, have told my credit card company to refuse all further charges and have all the e-mail backup to proved my claim. Don't do it folks. Rip off. It's that plain and simple. I'll stick to Strivectin. This company is running a scam. They do not tell you that they will take $179.00 out of your account. The minute you request the free 30 day trial package for $4.95, they will put a hold on your money the very second you give them any info. I personally think that's a scam in my mind. I was not even told this when I called Nadine at customer service, who hung up on me. So I called back the very next day to get these charges off my card, and again Nadine answered and was very very rude. I had to go to the bank and close my debit card and fill out paper work to stop them from billing me. So don't order from this company if you don't want to do all this crap. Total Scam. After finding out they charged me $179.00 on my debit card, unauthorized, they told me "oh, we didn't charge you". Well why in the heck is it appearing on my bank account? I cancelled my order immediately. I will never ever do business with DermaSet. As a former business owner, this is one heck of a way to scam hardworking people out of their money. I am also reporting them to BBB. What they don't tell you upfront is that if you don't return the unused potion of the 60-day supply in 30 days at your own expense, they will charge the card you used to pay the shipping $179 dollars! Someone tweeted to actress Tricia Helfer (Ascension, Battlestar Galactica and more) an ad with her "endorsing" this stuff tonight. She had no idea what it was and was surprised to the point of saying "WTF"! They do not tell you that you have return and cancel in 30 days or they charge you. This is the worst product and a TERRIBLE company and a disgrace to good vendors. I will tell everyone I know how bad they are. Write a Review for DermaSet Skin Care!